The fourth Ticonderoga (CV 14) was laid down as Hancock on 1 February 1943 at Newport News, Va., by the Newport News Shipbuilding & Dry Dock Co. ; renamed Ticonderoga on 1 May 1943, launched on 7 February 1944, sponsored by Miss Stephanie Sarah Pell, and commissioned at the Norfolk Navy Yard on 8 May 1944, Capt. Dixie Kiefer in command. Ticonderoga remained at Pearl Harbor for almost a month. She and USS Carina (AK-74) conducted experiments in the underway transfer of aviation bombs from cargo ship to aircraft carrier. Following those tests, she conducted air operations ó day and night landing and antiaircraft defense drills ó until 18 October 1944 when she exited Pearl Harbor and headed for the western Pacific. After a brief stop at Eniwetok, Ticonderoga arrived at Ulithi Atoll in the Western Carolines on the 29th. There she embarked Rear Admiral A. W. Radford, Commander, Carrier Division 6, and joined Task Force (TF) 38 as a unit of Rear Admiral Frederick C. Sherman's Task Group (TG) 38.3. The carrier sortied from Ulithi with TF 38 on 2 November. 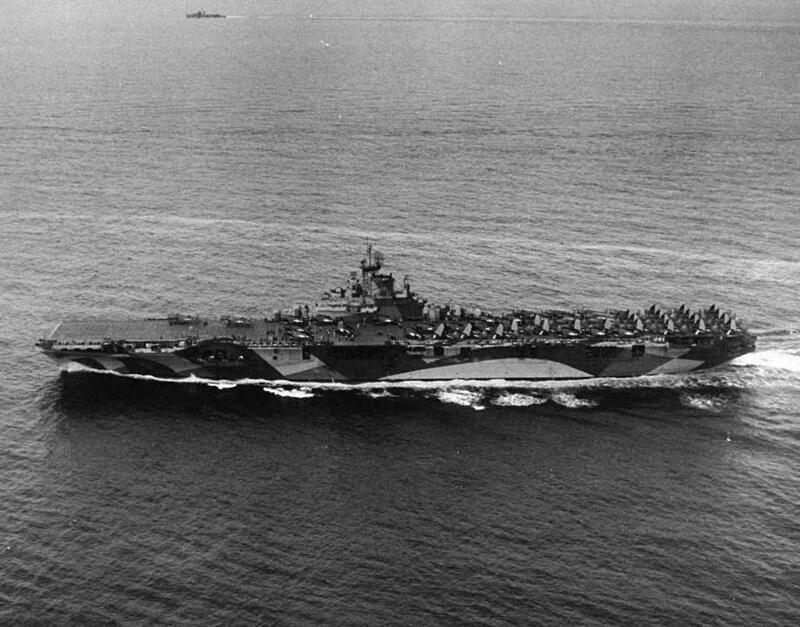 She joined the other carriers as they resumed their extended air cover for the ground forces capturing Leyte. She launched her first air strike on the morning of 5 November. The planes of her air group spent the next two days pummeling enemy shipping near Luzon and air installations on that island. Her planes bombed and strafed the airfields at Zablan, Mandaluyong, and Pasig. They also joined those of other carriers in sending the heavy cruiser Nachi to a watery resting place. In addition, Ticonderoga pilots claimed six Japanese aircraft shot down and one destroyed on the ground, as well as 23 others damaged. Around 1600 on the 5th, the enemy retaliated by sending up a flock of planes piloted by members of the suicide corps dubbed kamikaze, or "Divine Wind," in honor of the typhoon that had destroyed a Chinese invasion fleet four centuries previously. Two of the suicide planes succeeded in slipping through the American combat air patrol and antiaircraft fire to crash into USS Lexington (CV 16). Ticonderoga emerged from that airborne banzai charge unscathed and claimed a tally of two splashes. On 6 November, the warship launched two fighter sweeps and two bombing strikes against the Luzon airfields and enemy shipping in the vicinity. Her airmen returned later that day claiming the destruction of 35 Japanese aircraft and attacks on six enemy ships in Manila Bay. After recovering her planes, the carrier retired to the east for a fueling rendezvous. While her air group busily pounded the Japanese, Ticonderoga's ship's company also made their presence felt. Just after noon, a torpedo launched by an enemy plane broached in USS Langley's (CVL 27) wake to announce the approach of an air raid. Ticonderoga's gunners raced to their battle stations as the raiders made both conventional and suicide attacks on the task group. Her sister ship USS Essex (CV 9) erupted in flames when one of the kamikazes crashed into her. When a second suicide plane tried to finish off the stricken carrier, Ticonderoga's gunners joined those firing from other ships in cutting his approach abruptly short. That afternoon, while damage control parties dressed Essex's wounds, Ticonderoga extended her hospitality to that damaged carrier's homeless airmen as well as to USS Intrepid (CV 11) pilots in similar straits. The following day, TF 38 retired to the east. During the night of 9 and 10 January, TF 38 steamed boldly through the Luzon Strait and then headed generally southwest, diagonally across the South China Sea. Ticonderoga provided combat air patrol coverage on the 11th and helped to bring down four enemy planes which attempted to snoop the formation. Otherwise, the carriers and their consorts proceeded unmolested to a point some 150 to 200 miles off the coast of Indochina. There, on the 12th, they launched their approximately 850 planes and made a series of anti-shipping sweeps during which they sank a whopping 44 ships, totaling over 130,000 tons. After recovering planes in the late afternoon, the carriers moved off to the northeast. Heavy weather hindered fueling operations on the 13th and 14th, and air searches failed to turn up any tempting targets. On 15 January 1945, fighters swept Japanese airfields on the Chinese coast while the flattops headed for a position from which to strike Hong Kong. The following morning, they launched antishipping bombing raids and fighter sweeps of air installations. Weather prevented air operations on the 17th and again made fueling difficult. It worsened the next day and stopped replenishment operations altogether, so that they were not finally concluded until the 19th. The force then shaped a course generally northward to retransit Luzon Strait via Balintang Channel. Two days after her arrival, Ticonderoga sortied from Ulithi with TF 68 and headed north to spend the last weeks of the war in Japanese home waters. Three days out, Admiral Halsey relieved Admiral Spruance, the 5th Fleet reverted back to 3d Fleet, and TF 68 became TF 38 again for the duration. On 2 and 3 June 1945, Ticonderoga fighters struck at airfields on Kyushu in an effort to neutralize the remnants of Japanese air power ó particularly the Kamikaze Corps ó and to relieve the pressure on American forces at Okinawa. During the following two days, Ticonderoga rode out her second typhoon in less than six months and emerged relatively unscathed. She provided combat air patrol cover for the 6 June refueling rendezvous, and four of her fighter s intercepted and destroyed three Okinawa-bound kamikazes. That evening, she steamed off at high speed with TG 38.4 to conduct a fighter sweep of air-fields on southern Kyushu on the 8th. Ticonderoga's planes then joined in the aerial bombardment of Minami Daito Shima and Kita Daito Shima before the carrier headed for Leyte where she arrived on the 13th. The shock of peace, though not so abrupt as that of war almost four years previously, took some getting used to. Ticonderoga and her sister ships remained on a full war footing. She continued patrols over Japanese territory and sent reconnaissance flights in search of camps containing Allied prisoners of war so that air-dropped supplies could be rushed to them. On 6 September, four days after the formal surrender ceremony on board USS Missouri (BB-63), Ticonderoga entered Tokyo Bay. Her arrival at Tokyo ended one phase of her career and began another. She embarked homeward-bound passengers and put to sea again on the 20th. After a stop in Pearl Harbor, the carrier reached Alameda, Calif., on 5 October. She disembarked her passengers and unloaded cargo before heading out on the 9th to pick up another group of veterans. Ticonderoga delivered over a thousand soldiers and sailors to Tacoma, Wash., and remained there through the 28th for the Navy Day celebration. On 29 October 1945, the carrier departed Tacoma and headed back to Alameda. Enroute, all of the planes of Air Group 87 were transferred ashore so that the carrier could be altered to accommodate additional passengers in the "Magic-Carpet" voyages to follow. Following the completion of those modifications at the Pearl Harbor Naval Shipyard in November, the warship headed for the Philippines and arrived at Samar on 20 November. She returned to Alameda on 6 December and debarked almost 4,000 returning servicemen. The carrier made one more "Magic-Carpet" run in December 1945 and January 1946 before entering the Puget Sound Naval Shipyard to prepare for inactivation. Almost a year later on 9 January 1947, Ticonderoga was placed out of commission and berthed with the Bremerton Group of the Pacific Reserve Fleet. On 31 January 1962, Ticonderoga came out of reserve and went into reduced commission for the transit from Bremerton to New York. She departed Puget Sound on 27 February and reached New York on 1 April. Three days later, she was decommissioned at the New York Naval Shipyard to begin an extensive conversion. During the ensuing 29 months, the carrier received the numerous modifications ó steam catapults to launch jets, a new nylon barricade, a new deck-edge elevator and the latest electronic and fire control equipment-necessary for her to become an integral unit of the fleet. On 11 September 1954, Ticonderoga was recommissioned at New York, Capt. William A. Schoech in command. In January 1955, the carrier shifted to her new home port of Norfolk, Va., where she arrived on the 6th. Over the next month, she conducted carrier qualifications with Air Group 6 in the Virginia Capes operating area. On 3 February, she stood out of Hampton Roads for shakedown near Cuba, after which she returned via Norfolk to New York for additional alterations. During the late summer, the warship resumed carrier qualifications in the Virginia capes area. After a visit to Philadelphia early in September, she participated in tests of three new planes ó the A4D-1 Skyhawk, the F4D-1 Skyray, and the F3H-2N Demon. Ticonderoga then returned to normal operations along the east coast until 4 November when she departed Mayport, Fla., and headed for Europe. She relieved USS Intrepid (CV 11) at Gibraltar 10 days later and cruised the length of the Mediterranean during the following eight months. On 2 August 1956, Ticonderoga returned to Norfolk and entered the shipyard to receive an angled flight deck and an enclosed hurricane bow. Those modifications were completed by early 1957 and, in April, she got underway for her new home port of Alameda, Calif. She reached her destination on 30 May, underwent repairs, and finished out the summer with operations off the California coast. On 16 September, she stood out of San Francisco Bay and shaped course for the Far East. Enroute, she stopped at Pearl Harbor before continuing west to Yokosuka, Japan, where she arrived on 15 October. For six months, Ticonderoga cruised Oriental waters from Japan in the north to the Philippines in the south. Upon arriving at Alameda on 25 April 1958, she completed her first deployment to the western Pacific since recommissioning. Ticonderoga's winter deployment of 1965 and 1966 was her first total combat tour of duty during American involvement in the Vietnam War. During her six months in the Far East, the carrier spent a total of 116 days in air operations off the coast of Vietnam dividing her time almost evenly between "Dixie" and "Yankee Stations," the carrier operating areas off South and North Vietnam, respectively. Her air group delivered over 8,000 tons of ordnance in more than 10,000 combat sorties, with a loss of 16 planes, but only five pilots. For the most part, her aircraft hit enemy installations in North Vietnam and interdicted supply routes into South Vietnam, including river-borne and coastwise junk and sampan traffic as well as roads, bridges, and trucks on land. Specifically, they claimed the destruction of 35 bridges as well as numerous warehouses, barracks, trucks, boats, and railroad cars and severe damage to a major North Vietnamese thermal power plant located at Uong Bi north of Haiphong. After a stop at Sasebo, Japan, from 25 April to 3 May 1966, the warship put to sea to return to the United States. On 13 May, she pulled into port at San Diego to end the deployment. Following repairs she stood out of San Diego on 9 July to begin a normal round of west coast training operations. Those and similar evolutions continued until 15 October, when Ticonderoga departed San Diego, bound via Hawaii for the western Pacific. The carrier reached Yokosuka, Japan, on 30 October and remained there until 5 November when she headed south for an overnight stop at Subic Bay in the Philippines on the 10th and 11th. On the 13th, Ticonderoga arrived in the Gulf of Tonkin and began the first of three combat tours during her 1966-67 deployment. She launched 11,650 combat sorties, all against enemy targets located in North Vietnam. Again, her primary targets were logistics and communications lines and transportation facilities. For their overall efforts in the conduct of day and night strikes on enemy targets, Ticonderoga and her air group earned their second Navy Unit Commendation. She completed her final line period on 27 April 1967 and returned to Yokosuka, from which she departed again on 19 May to return to the United States. Ten days later, the carrier entered San Diego and began a month-long, post-deployment stand-down. At the beginning of July, the warship shifted to Bremerton, Wash., where she entered the Puget Sound Naval Shipyard for two months of repairs. Upon the completion of yard work, she departed Bremerton on 6 September and steamed south to training operations off the coast of southern California. During the first month of 1969, Ticonderoga made preparations for her fifth consecutive combat deployment to the southeast Asia area. On 1 February, she cleared San Diego and headed west. After a brief stop at Pearl Harbor a week later, she continued her voyage to Yokosuka where she arrived on the 20th. The carrier departed Yokosuka on the 28th for the coast of Vietnam where she arrived on 4 March. Over the next four months, Ticonderoga served four periods on the line off Vietnam, interdicting communist supply lines and making strikes against their positions. During her second line period, however, her tour of duty off Vietnam came to an abrupt end on 16 April when she was shifted north to the Sea of Japan. North Korean aircraft had shot down a Navy reconnaissance plane in the area, and Ticonderoga was called upon to beef up the forces assigned to the vicinity. However, the crisis abated, and Ticonderoga entered Subic Bay on 27 April for upkeep. On 8 May 1969, she departed the Philippines to return to "Yankee Station" and resumed interdiction operations. Between her third and fourth line periods, the carrier visited Sasebo and Hong Kong. The aircraft carrier took station off Vietnam for her last line period of the deployment on 26 June and there followed 37 more days of highly successful air sorties against enemy targets. Following that tour, she joined TF 71 in the Sea of Japan for the remainder of the deployment. Ticonderoga concluded the deployment, a highly successful one for she received her third Navy Unit Commendation for her operations during that tour of duty, when she left Subic Bay on 4 September 1969. Ticonderoga arrived in San Diego on 18 September. After almost a month of post-deployment stand-down, she moved to the Long Beach Naval Shipyard in mid-October to begin conversion to an antisubmarine warfare (ASW) aircraft carrier. Overhaul and conversion work began on 20 October 1969, and Ticonderoga was redesignated CVS-14 on the 21st. She completed overhaul and conversion on 28 May 1970 and conducted exercises out of Long Beach for most of June. On the 26th, the new ASW support carrier entered her new home port, San Diego. During July and August, she conducted refresher training, refresher air operations, and carrier landing qualifications. The warship operated off the California coast for the remainder of the year and participated in two exercises, HUKASWEX 4-70 late in October and COMPUTEX 23-70 between 30 November and 3 December. Ticonderoga remained active for nine more months, first operating out of San Diego and then making preparations for inactivation. On 1 September 1973, the aircraft carrier was decommissioned after a board of inspection and survey found her to be unfit for further naval service. Her name was struck from the Navy list on 16 November 1973. Ther ship was disposed of, sold by Defense Reutilization and Marketing Service (DRMS) for scrapping 1 September 1975. Ticonderoga received five battle stars during World War II and three Navy Unit Commendations, one Meritorious Unit Commendation, and 12 battle stars during the Vietnam War.